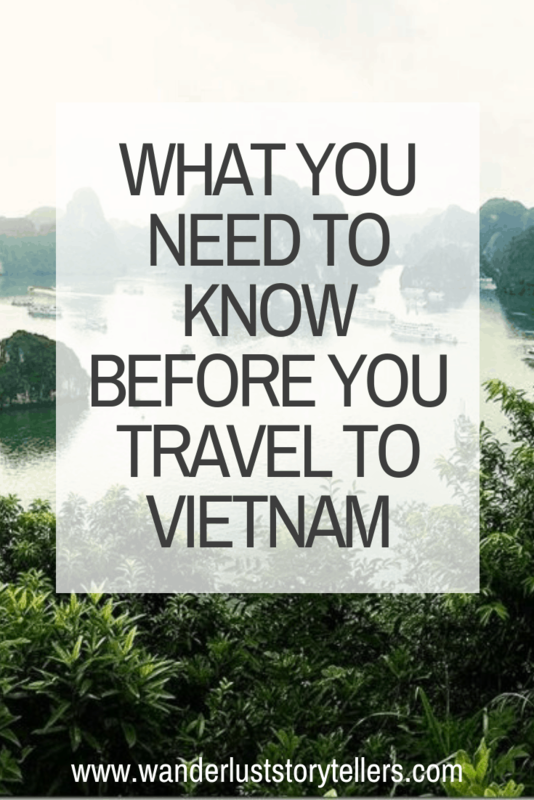 What you NEED to Know before you Travel to Vietnam! 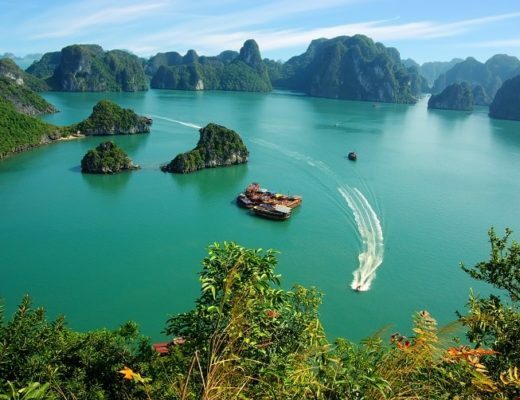 Vietnam happens to be one of our absolute favourite Asian countries to visit! A country which will give you a sensory overload, one with an incredible history and an absolutely captivating culture. For many travelers, Vietnam still remains to be a fairly exotic country to visit. For others, it might even be a bit ‘scary' to visit a country that is so different to their own. Vietnam is worth a visit, but it is important to prepare yourself for your trip. Our Vietnam travel tips have been carefully compiled to help you, so you know what to expect as you travel around Vietnam. After a quick summary of this post? Why not grab out FREE printable Vietnam Essentials Cheat Sheet PDF! If you would like to set your mood and tone for Vietnam, why not check out our ”Ultimate Reading List of Vietnam Books for a Traveler!” – Click here to read! FREE! 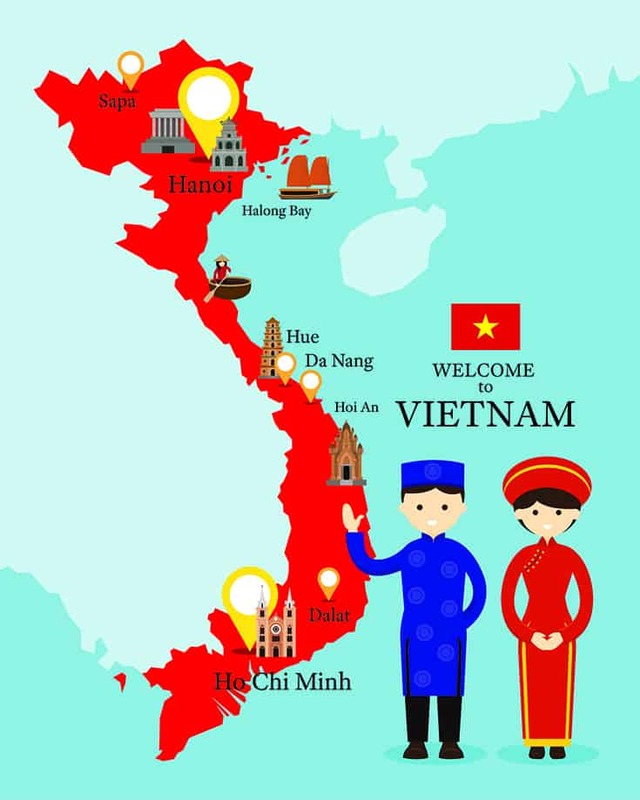 Click to grab the FREE Vietnam Cheat Sheet PDF! 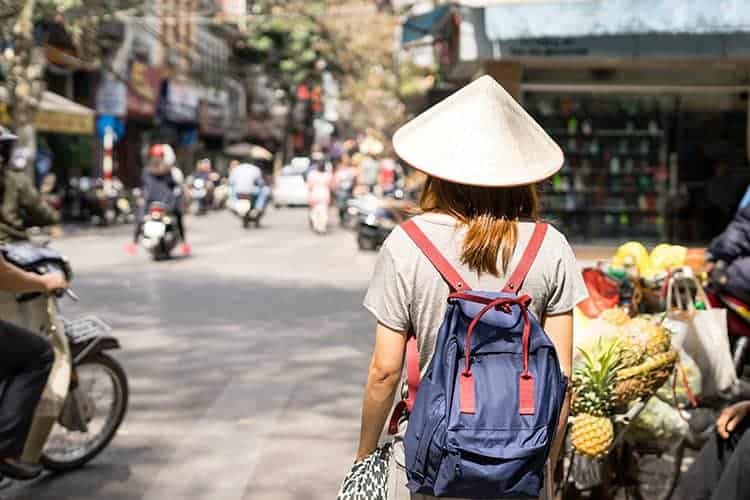 Always check with your preferred doctor in regards to vaccinations required for countries you will be visiting, however, according to the CDC site, the following are recommended vaccinations for travels to Vietnam. Hepatitis A due to the possibilities of contaminated food and water in Vietnam; regardless of where you are staying or eating. We chose to get Hep A and Typhoid shots. We did not bother with Malaria tablets as the regions we visited did not have any malaria warnings! A Vietnam visa is required for most nationalities. Note: Passport holders of Germany, France, the UK, Italy and Spain are exempted from Vietnamese visa from 01st July 2017 to 30th June 2018. For the rest of us, please read for more info on the visa process below. Vietnam Visa on Arrival (VOA) is recommended for those of you who will be arriving to Vietnam via air. Vietnam Visa at the Embassy is recommended for those of you who will be arriving to Vietnam by car, train, boat, but or air. 2. Make sure you give yourself plenty of time before you travel to organize your visa. You do not want to leave it to the last minute. I would recommend you do it around 1 month before your departure date. 3. Make sure to print out the letter of approval as you will have to show it before boarding the plane, as well as at the VOA counter on arrival to Vietnam. 1. You need to obtain a letter of approval, you can do this through your hotel, through your travel tour agency or through VOA focused agency. An easy option is to simply use an online VOA agency to complete your online Vietnam Visa application. 4. Cost of visa for Vietnam: At the VOA counter in Vietnam, you will have to pay a visa processing fee of $25 US per person (for a 1-month visa, if you wish to stay longer, it will cost more money). You need to have this money in US currency and in the exact amount. 5. 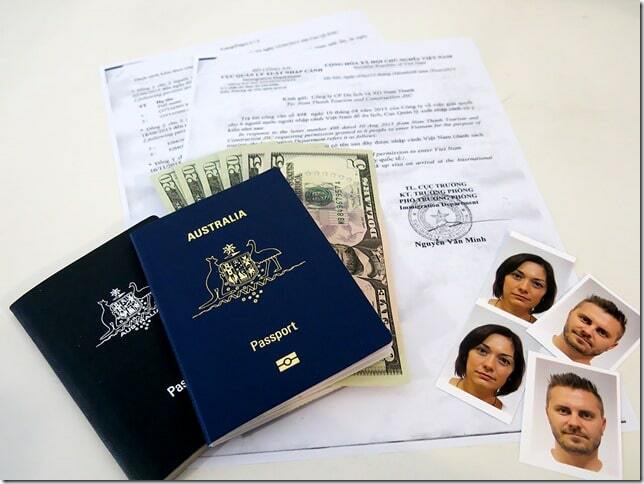 And the last important thing, you must provide 2 photos each to complete the paperwork. >>> Get it done now! Click here to fill out your online application today, before you forget about it! or at the local flight agency where you might be organizing your tickets. Those choices, however, will be a more costly and you will be expected to hand over your passport as it needs to be couriered to the embassy. People still question whether Vietnam is safe or not, especially if you are travelling to Vietnam solo. Vietnam is a perfectly safe country to visit, safer I would say that a lot of other countries. Whilst we recommend exercising normal precautions to look after your belongings as you explore; just as you would in any other country; we found nothing but friendly, happy, smiling people who welcomed us with open arms to their country. We felt safe … safe enough to explore the majority of the major tourist destinations on our own terms, without having to be in tour groups or with guides. If you are interested, you can educate yourself in regards to the most common scams in Vietnam, by reading this site here. We highly recommend that you get travel insurance. Our favourite travel insurance company, World Nomads, provides 24/7 emergency assistance (just for in case), they cover 150+ activities, they offer trip cancellation, emergency medical expenses and emergency medical transportation benefits. We love this insurance company because they include cover for your gear – bags, laptop, camera etc. and most other insurance companies only do this at an extra expense! It is always to be safe than sorry! We have had to use our travel insurance in the past for medical expenses as well as flight cover (we were too sick to fly). >> Click here to see the price for our favourite travel insurance company. Should I get a Vietnam Guidebook? English is not widely spoken in Vietnam. If you get lost, you might be out of look asking a local to help you, as they might not understand what you are saying! We tried showing them a map on our phone, but not many of them could understand the map (they don't use maps and probably have never had to try and find locations on one). So we highly recommend that you invest in a good guidebook and/or map. We do recommend you purchase a paper map as WiFi isn't also available (although you will have access to WiFi in all major cities). Vietnam is 7 hours ahead of GMT/UTC. It is tricky finding the perfect time to see the whole of Vietnam as their climate in the North is so different to the climate in the South! We went in September and found that it worked out well for all regions of Vietnam. However when you plan to travel to Vietnam, the recommendation is to travel to the North from March – May & September – November. For central Vietnam, go March – September and for the South, it is best to travel from November – February. High Season: July to August – Expect to pay higher prices for hotels, ensure you book ahead of time! Expect hot and humid weather! Shoulder Season: December to March – The Tet festivals brings with it higher prices for accommodation. Beautiful weather in the South, but cold weather in the North. Low Season: April to June & September till November – Cheaper hotel prices, cooler weather but risky typhoon conditions through central and north coastline. The local currency used is Vietnamese Dong. ATM’s are readily available in most locations, unless very remote and rural. Credit card payments are also accepted at most hotels, however, do not rely on them being accepted at restaurants, bars or stores. 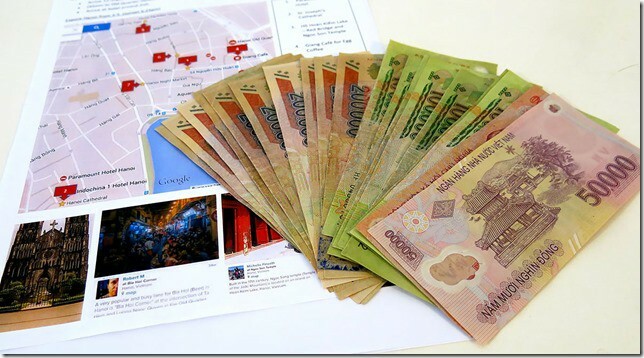 We had no trouble getting hold of more money as needed throughout our trip to Vietnam. Vietnamese is the traditional language spoken across the country. English is not widely spoken in Vietnam. You can expect the Vietnamese to speak basic English in all touristy areas, hotels, shops etc. So it will be important to learn a few key phrases to help you along! 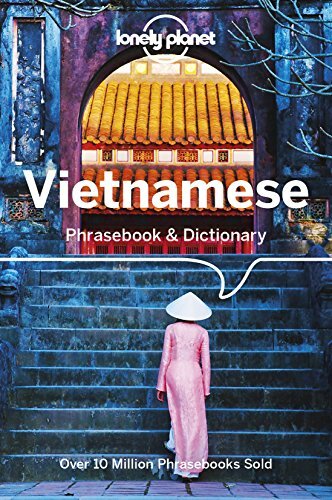 Click here to grab a Vietnamese Phrasebook from Amazon. Wondering where to Stay in Vietnam? Check out our list of where we stayed throughout Vietnam here! The easiest way to get around Vietnam is via plane. However, there are options available to suit any budget. By Scooter: The easiest way to explore each town/city within Vietnam is via motorbike rentals. We loved renting a scooter and just exploring on our own, but you can also grab a spot on a motorbike tour if you wish. By Plane: To cover long distances really quickly, we recommend you purchase some domestic flights. Use Baolau who specialize in travel around Vietnam to find your choice of flight. We chose to fly from HCMC to Hanoi, from Hanoi to Danang (to visit Hoi An), and from Danang back to Hanoi. By Bus: Bus travel in Vietnam is pretty convenient. If you don't want to catch the local buses, there are also plenty of mini-buses available that operate to take tourists from point A to point B. We used bus travel from Sapa to Hanoi and from Hanoi to Halong Bay (and back again) and had a pleasant comfortable transfer. Click here to search for bus tickets. By Train: Train travel in Vietnam tend to be pretty cheap as the trains are pretty basic. Many travellers prefer to travel by train so that they can still get a view of the landscape passing by. Click here to search for your train tickets. We used train travel from Hanoi to Sapa. The trains on this route have special cabins for tourists that offer more comfort. Use the search box below to easily find your option of transport from one destination to the next in Vietnam. Click here to read about how to get from Danang to Hoi An. Click here to read about how to get from Hanoi to Hoi An. Click here to read about how to get from Hanoi to Sapa by train and/or bus. 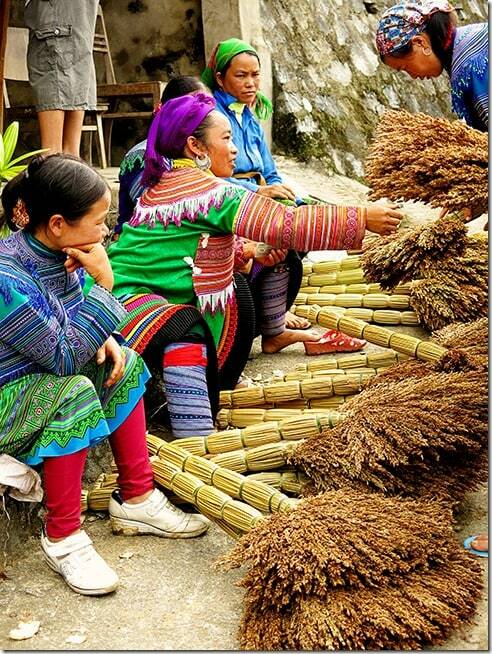 Ha Giang: Known for its spectacular mountain scenery and traditional hill tribes. Read more about how to enjoy the Ha Giang motorbike loop. Sa Pa: For its incredible scenery of cascading rice paddy fields, sensational mountains as well as the culture found in the minority groups. Read about our hike through Sapa here. For information on how to get to Sapa from Hanoi, click here. Hanoi: Captivating capitol filled with historical treasures and bucket loads of culture! We love the Old Quarter! To read more about some authentic areas to explore in Hanoi, click here. And for the more typical touristy attractions in Hanoi, click here. 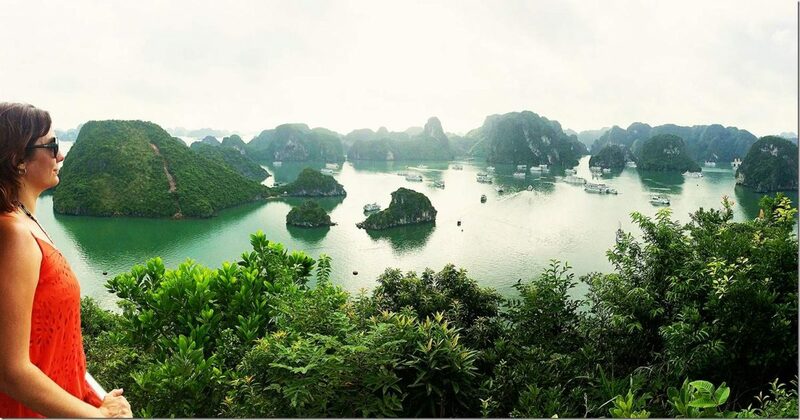 Ha Long Bay: For picture-perfect scenery of towers of limestone islands! Do a 2-night cruise here, you won’t regret it! 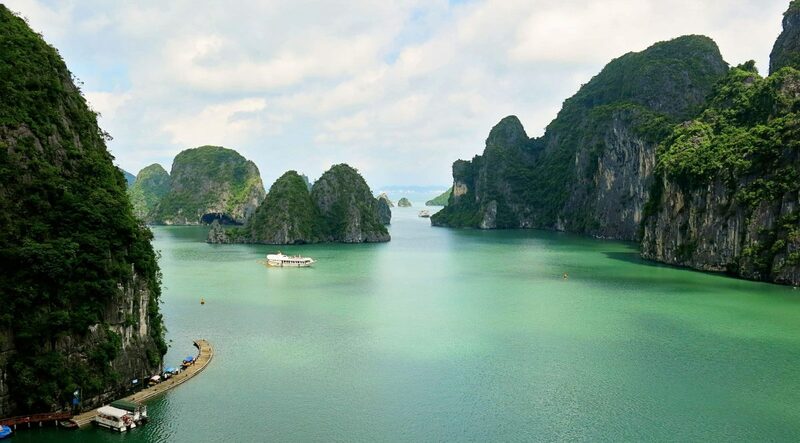 You can read about our Halong Bay experience here and to find out which boat company we chose, click here! 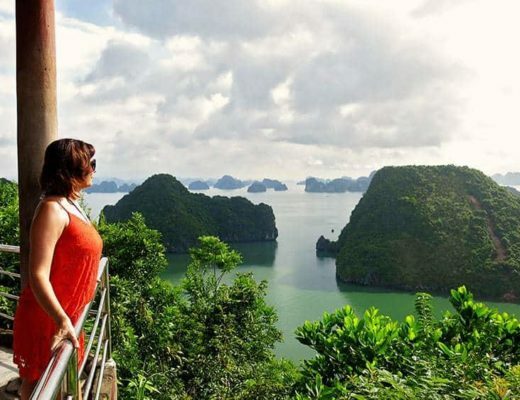 Or if you prefer, you can find our guide of cruise companies that will help you find the best Halong Bay tour here. Phong Nha-Ke Bang: For the most impressive caves, beautiful rivers, traditional villages and more breathtaking mountain scenery! Read more about the World's Largest Cave here! Hue: Former Imperial City that captivates hearts young and old! Enjoy watching the buzz of activity on the perfume river, strolling through the historic buildings and enjoying the sensational local cuisine! Hoi An: An ancient local port, where the old buildings are still found in mostly their original state. Enjoy wandering down the colourful, lantern-filled alleys in the Old Town! Read our post about Hoi An Ancient Town here. For some fun exploration of the Hoi An countryside, click here and to learn more about which beach to visit in Hoi An, click here. Nha Trang: A popular beach spot for the tourists to enjoy! Whilst it has turned into a bit of a party-beach, loads of beautiful beach scenery can also be found here! Mui Ne: The adrenaline epicentre of Vietnam! Learn more about things to do in Mui Ne here. Ho Chi Mihn City: An enormous city where traffic and people seemed to be synchronized. A complete mix of a modern with touches of the old! Phu Quoc Island: A beautiful, paradise island to find total relaxation and bliss in! See our post on how to visit Phu Quoc Island with kids. Tip: One of the best ways to see the country is by choosing an organised trip. You can check out some of the best Vietnam Tours here! As with most Asian countries, it is important to bring your bargaining skills with you. Bargaining is expected in the marketplace and smaller shops that are created for tourists. Also feel free to bargain when it comes to cyclo rides, and tour expeditions. Prepare yourself for some typically Asian crazy driving! There seems to be no road rules that are followed, people can come from all different directions and stopping at traffic lights seems to be a choice. Regardless, there seems to be some reasoning to the madness as the swarms of scooters and few select cars seem to be driving in a synchronised manner. Expect locals to try and charge you ‘tourist prices’, remember the value of their currency in regards to your own and pick your battles only when necessary. In most of the touristy hotspots, you can expect a fair share of vendor hassling from the locals. It is their way to survive and produce an income and they can be pretty persistent. Stand your ground or simply ignore them when it seems to become too much. We found that a simple but assuring ‘NO THANKS’ did the trick with most of the vendors! You should also expect to fall in love with the fresh complex flavours of the dishes found in Vietnam. Each region of Vietnam specialises in different sorts of dishes. All so yummy! Expect your Vietnamese coffee to be stronger than normal! It also comes with a gorgeous load of condensed milk instead of milk. Most cafes offer a range of coffees for tourists, so do test drive a few types to see what works for you! 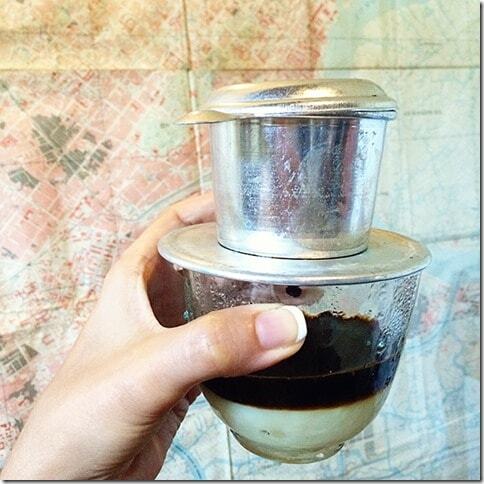 You can read our post about coffee in Vietnam here. 3. How are you? – Ban co khoe khong? (ban co kwe khome?) also, Ban the nao? 21. Oh my god! Too expensive – Oi choi oi! Dep qua! , this book will take you a long way! It is almost essential to carry along when you travel to Vietnam! After some Essential tips before you travel to Vietnam? Click to read one of our most popular posts containing bucket-loads of tips and hints of how to prepare for Vietnam! After stories about our travels to Vietnam? Click to read our comprehensive, informative stories of our travels through Vietnam! 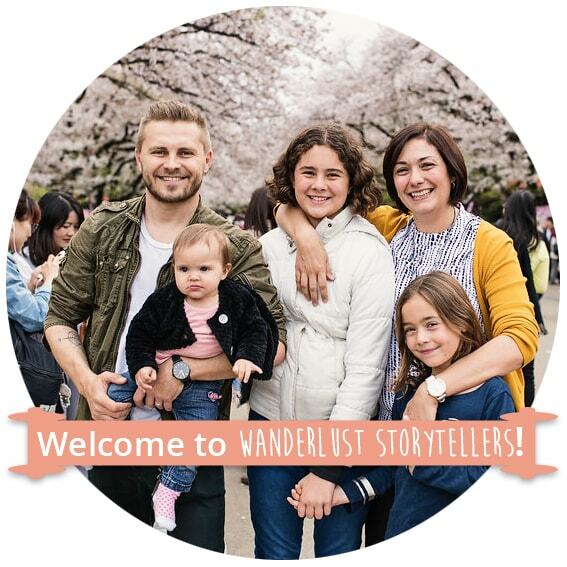 Wanderluststorytellers.com is a participant in the Amazon Services LLC Associates Program, an affiliate advertising program designed to provide a means for sites to earn advertising fees by advertising and linking to amazon.com and other Amazon sites. A great phrase we used in Vietnam was “Oi choi oi! Dep qua!” (Oh my god! Too expensive). When said in an OTT kind of way, people would find it hilarious and generally drop the price loads 🙂 infact, oi choi oi works pretty well in all situations! Oh nice tip!! I like it 🙂 Will have to try it out next time haha! I am headed to Vietnam for the first time with my boyfriend in April. Thank you so much for your suggestions. My boyfriend is Vietnamese so I am hoping that gives a little more flexibility when we are there. Ah great! Vietnam is incredible 🙂 Have a great time! Thank you very for your love to Vietnam. I am Chau. I am 23 years old. I am leaving in Saigon. If next time you come to Vietnam, please whatsapp me at +84 1647409812 or my email [email protected] I will take you arround Saigon and enjoy a lot of street food here. Thank you very much for the invitation! Will definitely keep it in mind for when we are traveling to Vietnam again!! Love Vietnam!!! Vietnam is inevitably the best family retreat because of its peaceful and fascinating heritage. To make the first visit memorable here are the best ways to enjoy your Vietnam family holiday with Nadova Tours. It definitely is a great family destination!! 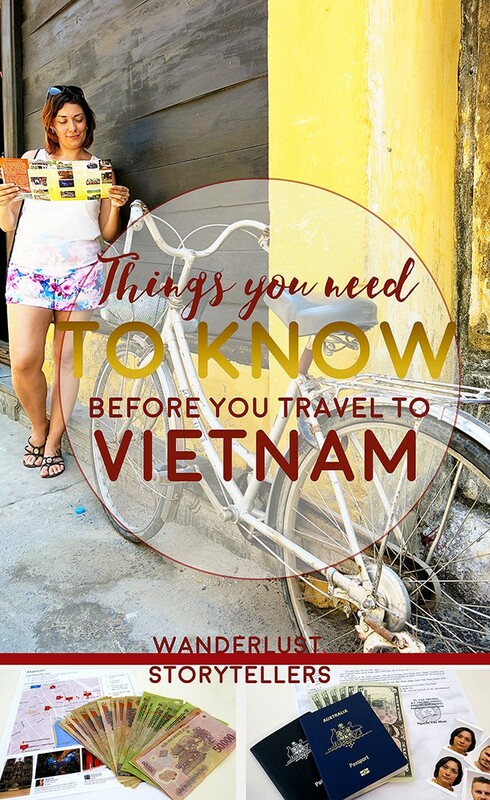 Hi JOLENE EJMONT thanks a lot for sharing this outstanding and informative post.The tips you have shared will surely a big help for those who are travelling to vietnam so that they can be well aware about the things they need to take care. There are many fake taxi at the airport in Vietnam. You should book a taxi at the hotel or use grab taxi, grab car to avoid being overcharged. You don’t have to pay tolls, so if you are asked to pay, refuse. Drivers in Vietnam often do not obey traffic laws. Ask them not to talk on the phone while driving, as they can drive the wrong way and charge higher than the actual, not to mention dangerous. One more, when crossing the road, slowly settle into the under-traffic, keep pace, do not hesitate, do not stop, do not text by phone or see the map when on the road. The vehicle will automatically adjust to you.